This weekend, last year, Dad and UB helped me build the glorious deck that sits perched on the backside of Monstrosity (the name The Wife has loving given our home). Ever since I have this sense of empowerment to build things. Lots of things. However, only a few things have come to fruition. Granted, my skills are less than professional, amateur at best and appear more like they came from the hands of a 10 year old colonial settler than anything. That said, I am a man and thus, I must build and use tools. The Wife and I have been planning a home garden project since last summer. Frankly, we are just tired paying high prices for fresh produce. Why pay when you can grow for free!? So after some convincing from the wife, I finally went to our favorite home improvement store and purchased the wood and supplies to build a raised garden bed. 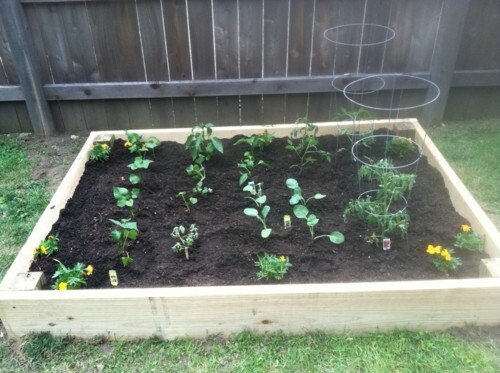 I set out in the morning to get some yard work finished and begin building my garden bed. I collected all of my tools, took them out to the garage and readied myself for the project…….only to realize I had absolutely no means of attaching a single piece of wood to another piece. Crap. Thus initiated my first trip to the hardware store. Upon my return, I set to work cutting the wood……you know, measure 50 times, second guess yourself, measure another 20 times and make your cuts holding your breath and praying it all works out in the end. Wait, is that just me? I made a very basic box, 6’ x 4’ x 8” with 4’ x 4’ x 18” posts in each corner. The extra 10” of the posts to be placed in post-holes to help secure the box. In less than 30 minutes I had the wood bits cut and the garden box assembled, then realized this thing is bigger than me and I somehow have to transport this box into the fenced-in backyard to the opposite fence-line. This is when you realize that when building something larger or heavier than yourself, it would be prudent to plan ahead, build near the “drop zone” or have a second set of hands to help. I did none of that. Instead, I attempted to carrying the thing myself which lasted a good 5 feet. Then, I wizened up and started turning the box end over end and essentially rolling it across the driveway, through the gate and across the backyard to its resting place. I dug my post holes, removed the top layer of turf, set my box and back-filled the post-holes. I lined the inside of the garden box with a layer of cardboard (mostly from left-over boxes). This layer has several purposes: 1) keeps grass and weeds from growing up in the bed; 2) keeps any lead in the soil from absorbing into the vegetables/compost; 3) keeps varmint from burrowing up into my bed from below. We have (from left to right): corn (seeded), sweet potatoes, peas, 2 varieties of bell peppers, broccoli, 3-4 varieties of tomatoes and more seeded corn. Those yellow blobs in the corners are marigolds; rumor has it they are good for deterring rabbits and varmint. Yes, that is a wheelbarrow acting as another bed. 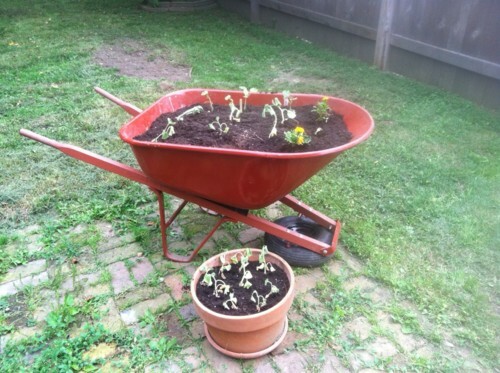 The wheel on my wheelbarrow broke off (for the 4th and last time) so I turned it into a fun garden bed. In the wheelbarrow we have watermelon and cantaloupe; in the pot is more cantaloupe. Depending on how they grow, I may have to find more space for the melons but for now just wanted them planted so they wouldn’t wilt and die. The Wife and I are officially gardeners! And, thanks to the two most empowering men in my life it was all DIY!! The following websites are where my inspiration came from, check them out!